Caladiums originated on the banks of the Amazon River and are grown in the garden for their large tropical and multicolored foliage, usually a red, pink and white mix. Caladiums have underground root stems often categorized under the loose term “bulb,” but they actually have tubers that need a rest period each winter in order to grow and thrive. 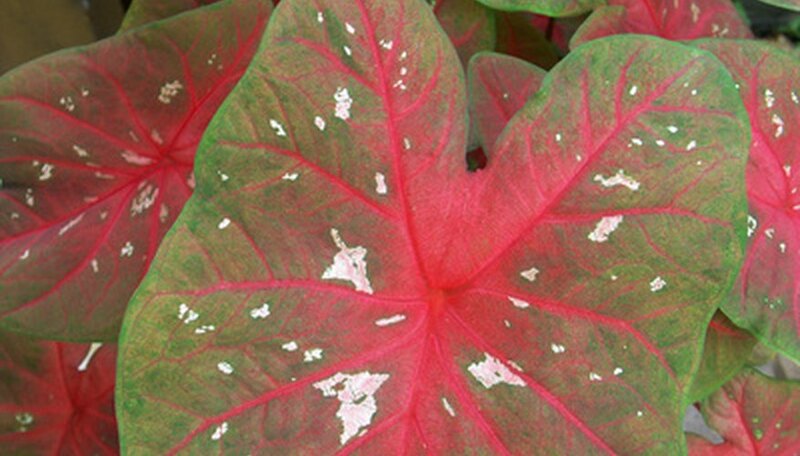 Unfortunately, after the first year, the foliage colors and size are not as good as the first, but your older caladiums will still add an exotic feel to your garden, especially if properly stored during the winter. Cut off the foliage to the ground with pruning shears in the fall after the leaves begin to fade. In area with frosts, this occurs after the first killing frost. Remove the tubers from the ground gently with a trowel or garden fork. The bulbs are just beneath the soil’s surface. Do not brush off or remove the soil. Brush off the dry soil with your hands. Remove any fleshy roots with a hand clipper (or just pinch them off) and cut out any rotten parts on the bulbs with a sharp knife. Dust caladium bulbs with a fungicide, such as sulfur or a fungicide labeled for bulbs (sometimes called “bulb dust”). Bury the bulbs in a container with dry peat, vermiculite, sand or saw dust. The bulbs should not touch each other. Place the container in an area that is low in humidity and cool, ideally around 50 degrees F; storing them in cooler areas, as long as it's not freezing, is OK as well. A garage or unheated closet may work. Leave them there until spring, when you can plant them again after the last frost.